It’s fair to say that New York City and San Francisco are the darlings of dense, walkable urban living in the US. It’s also fair to say that rents and house prices in those cities are bat-sh#t crazy expensive; median rents in those two cities exceed $2200/month according to Trulia (and we know this is a very low figure). But assessing the true cost of living in a particular city is not something that can be achieved with housing costs alone. Incomes for the region, cost of living and, importantly, transportation costs have a big hand in determining how much it really costs to live somewhere. Calculating these manyfold considerations is exactly what the Department of Housing and Urban Development’s (HUD) Location Affordability Index does for you. The Index has a national map that allows the public, businesses and government to access realtime data about the combined costs of living in an area relative to average incomes. For example, a single professional in Soho NYC annually pays $22K on rent and $5300 on transportation, but because he or she makes almost $90K annually, the percentage of his or her income of the living expenses (28%) make it more affordable then suburban Westchester County (42%), where, despite its lower rents, is less affordable due to increased transportation costs and lower incomes. The map gets pretty detailed, allowing you to zoom in on very small regional zones. For example, the Index provides data for almost every block of the small neighborhood in Brooklyn where I live. The Index has a variety of filters, allowing you to see the expenses as they relate to renting your home, owning or combined. I also gives you the ability to search depending on your marital status and income bracket: moderate income family, working single, single-parent-family, etc. 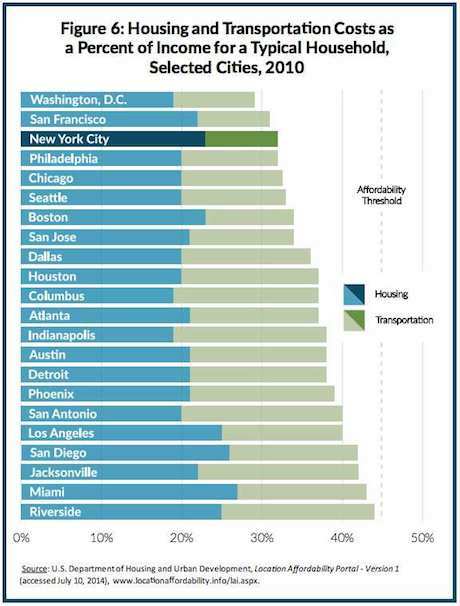 Interestingly, the Index showed Washington DC, San Francisco and New York City as the most affordable major US cities, besting places like Houston, Indianapolis and Phoenix. Needless to say, the Index uses fairly broad data (e.g. I know few people in Soho who pay less than $2K/month for rent), but it is pretty informative. One of the prime reasons people move out of cities is housing costs. For a one bedroom in San Francisco, you might be able to buy a four bedroom house in Sacramento. But as the Index shows, you can’t look at housing expenses in a bubble. is this disposable income or gross income? I completely disagree with this study. I live in San Francisco and it’s not affordable. I think that the data the study is built off is out of date or flawed. I looked at Mid Market near the new Twitter offices. According to the survey, a single professional earns about $72K per year would spend up to 25% of their income on rent. in Mid Market. There are 2 large apartment complexes, within a block of the Twitter HQ, with 300-500 apartments each who are charging $3K per month for a studio. That’s 50% of gross income and probably 65%+ of net. very few San Franciscans pay that much for rent. An increasing number of people are paying very high rents. I’ve friends fighting no fault evictions (Ellis Act). Another is looking for a 3rd roommate to help pay their $3,800 rent for a 2 bedroom place. The complex, on the outskirts of the city, another friend has been living in for 3 years starting rents have gone up from $1,300-1,400 are now $1,900-2,100. A realtor friend has just sold a very ordinary 1,000 sq ft 2 bed 1 bath in Portero hill for $1.3 million. even though i penned this post, as a new yorker, i have to say i am a little leery of the some of the data, or say that a bunch of people throw the numbers off. in nyc, longtime renters might be skewing the numbers low, likewise, folks in the financial sectors (who i heard comprise 40% of our gdp), might be skewing the income numbers higher (substitute tech industry in sf). all that said, i was living outside the city fairly recently and even though my rent was lower, my transportation expenses were much higher, and overall people in the town i lived in didn’t seem to be raking it in. so people outside these pricey cities are being squeezed too, just in different ways, so i think there is some validity to the index’s data, though it needs to not be considered gospel. If they are including rent controlled units without correcting for the actual market value of the unit then the data is going to be skewed to make it look more affordable than it is. Anyone looking to move into San Francisco is going to have to pay market rate for their rent controlled unit. I lived in San Francisco for eleven years, I got in right before rent began to skyrocket. I payed $950 for a two bedroom flat in a six unit Edwardian. Everyone else there was paying around $1600.00. Is this 90k annual income before or after taxes. Making 90k after taxes is like making 125k a year. At that point a person could live anywhere.